1974, Kentucky. Brookside coal miners have tried to unionize, and their company, fearing a domino effect, refuses to sign their contract with the union, setting a 10-month strike into motion. 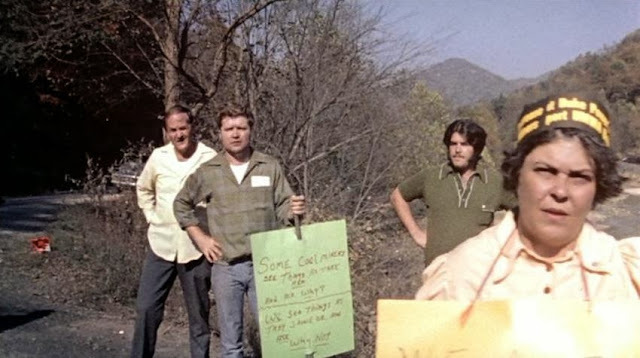 Barbara Kopple and her mostly female crew made their Oscar-winning documentary after spending years with the miners, bravely following them to the picket line in spite of threats from company 'scabs'. As a result, the scenes Kopple and her crew are privy to are riveting; she is knocked sideways in a hail of 'gun thug' bullets, witness to the solidarity as well as the squabbles of the tough-minded coalition of miner's wives, as well as to the inconsolable weeping of the mothers and wives left without the men of their family. It seems prescient that so much of the focus in Harlan County, USA is put upon women; Kopple seems interested in the ways deeply traditional swathes of the US still contained powerful matriarchal figures, women with voices and political agency. It is difficult to believe that the Harlan County seen through Kopple's lens existed in the mid-1970's, the era that begot disco. This is the land that time forgot, where children are washed in tin buckets and indoor plumbing is a hope for the future, where daddy almost invariably died as a result of working in the coal mine, and where families live in company-owned housing, awful little shantytowns of abject poverty. The chasm between working-class New Yorkers and these rural Southerners is evidenced through a conversation between a striking miner and a NYPD officer on his beat. Two American blue-collar workers, perhaps, but a vast gulf lies between their expectations and quality of life. The policeman's face slackens as he realises just how little money and medical care his Southern compatriot receives; it is a telling moment in a film full of them. As is explained, deadly accidents are frequently the result of unsafe conditions and poor regulatory practices; the conservative Southern power conglomerate that runs things is simply disinterested in reform. The strike recalls another in the 1930's that had long been a part of collective Kentucky memory; where their county earned the name 'Bloody Harlan' for the violent picket line clashes, executions, and evictions that happened periodically over several years. Through plaintive protest song and story, Kopple creates a portrait of these careworn and weary people, unchanged in their exploitation for the better part of half a century. Their adamant and unwavering determination to improve their lives and the lives of their children is clear; one elderly woman with a gaze of steel tells the camera, 'They can shoot me - but they can't shoot the union out of me.' This, of course, is no idle remark; the mining company and the police are clearly colluding, ignoring violence and gunshots from the company thugs and throwing miners in prison for obstructing the road. Kopple shows precisely what sort of conduct American women resort to when they have been oppressed, impoverished, and beset by tragedy for too long; and that conduct is commendable. Eventually, Brookside Mining Company will capitulate - but not before even more tragedy must beset the workers. 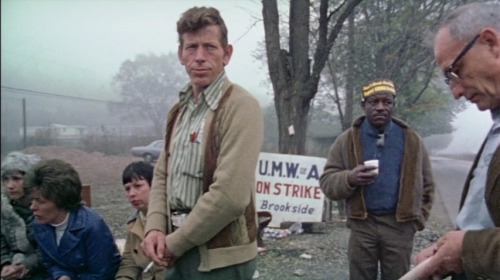 The film is in no way even-keeled; it stresses that the workers are the inevitably noble downtrodden. But it convinces its audience with pathos, power, and insight, revealing an immoral and profiteering system that must be struggled against, sometimes at enormous cost.